Independence Day is a classic piece of anti-white and anti-Christian propaganda. Like all “good” propaganda films, its message is subtle, but effective, especially when it is part of a large and continuing genre of anti-Western propaganda movies and television shows. Each propaganda element taken by itself can be innocuous, seemingly innocent, or somewhat defendable; but, when you look at all of the propaganda elements as part of the whole production, and in context of the overall genre of anti-white propaganda in the modern media, you can straight away discern a very clear pattern. 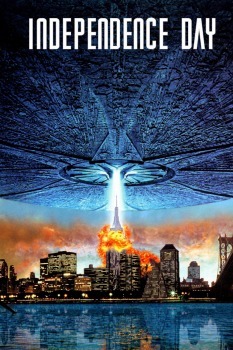 Independence Day sets the tone at the very start of the movie. Even though the story takes place in the majority-white USA, the very first person you see is an Asian scientist (played by James Wong), in a scene where he becomes aware of an extra-terrestrial pattern in the automated radio wave scanning system. The first thing he does is ring his scientist boss; but, no, he’s not White either, but a Bengali Indian (Erick Avari). The third person we see is another scientist, but this time it’s a black man Thom Barry. Then a white person finally appears, as the fourth actor in the film; a female scientist (Jana Marie Hupp). By itself, the lack of whites at the start of the movie could be defended or argued over; but wait, there’s more. The propaganda elements start to add up. How many action heroes are there in the movie, and how many of them are white Christians? Bearing in mind that the majority of the US population are both white and Christian, let’s have a look. The main hero of the movie is a black Marine Corps pilot, Captain Steven Hiller (Will Smith). The leader of the “welcome wagon” squadron, who fly up to greet the aliens, is a male black pilot, albeit that he plays a brief role. The aliens, who must be some sort of racists, blast him out of the sky. The only civilian hero is a black woman, Jasmine, who is Captain Hiller’s girlfriend (Vivica A. Fox), who drives around the ruins of post-attack America, picking up survivors, most of whom are white (presumably the subtle message there is that America needs more black people, because they are so helpful to everyone; also, that whites are a bit useless, and need to be rescued by blacks). When Will Smith flies a captured alien spacecraft into the heart of the alien mothership, it’s just him and a sidekick white man. That’s all as good as it goes; but the propagandists apparently didn’t want any Christians getting too much of a look-in, so they made the co-pilot role that of a Jewish male character, David Levinson (Jeff Goldblum), who also plays a heroic role; nothing wrong with that, but isn’t it odd that in a USA which is majority white and majority Christian, that the majority of the main action heroes are neither? Hmmm, it’s almost as if it was deliberate. A white Christian action hero does finally make an appearance in the form of Russell Casse (Randy Quaid); that’s if we can assume that he is of Christian background, from the context he appears in. But wait, he’s an alcoholic, and acts like he’s crazy, so unlike the non-white non-Christian heroes, he’s not too much of a positive role model. And just to make sure you know where the film’s makers are coming from, the background story they gave him is that he married a Mexican woman (long since dead), and that he has a boy from that marriage, as well as two step-children. So, he’s a multiracialist as well as being a poor role model. Or is that a tautology? Anyway, he does a kamikaze run into the alien mothership, so he gets hero status. Actually, the US President, Thomas Witmore (Bill Pullman), plays a hero role, too; as he leads the successful American assault against the alien mothership. If it can be assumed that he is a Christian, then there’s at least one positive white Christian role model. But with both Casse and Witmore, we can only assume that they are Christians, without any real evidence, as it appears that the only obviously Christian characters in this movie are allocated to those with negative roles. The US Secretary of Defence, Albert Nimziki (James Rebhorn), a white male, plays a role as a bit of a warmonger, always quick to go for a military option, whilst the other characters treat him with a bit of disdain. It is made known that this character was head of the CIA (in the 1950s, up to at least the 1970s, this would have been a positive attribute, but by the 1990s the CIA had developed a bit of a sinister reputation in movies, so it was apparently used to add another negative aspect to this character). When he is asked by the President why he didn’t tell him about the existence of Area 51, Nimziki talks about “plausible deniability”, thus casting him even further in the role of a dodgy and dislikeable person. Nimziki criticizes David Levinson’s plan to attack the alien mothership, whilst Hiller and the President back Levinson. Shortly thereafter, President Witmore physically bullies Nimziki, calls him a “snivelling little weasel”, and sacks him. Near the end of the film, in the Area 51 base, the now recently sacked and much discredited (ex) Secretary of Defence goes over to where Julius Levinson (Judd Hirsch) has gathered a circle of people on the floor to pray. Julius motions to Nimziki to join in, but as the ex-Secretary sits down, Levinson (wearing a yarmulke) starts praying in Hebrew, Nimziki (apparently a Christian) appears unsure if he is really welcome to be a part of the Jewish prayer session. Nimziki humbly lets Levinson know “I’m not Jewish”, to which he gets the reply, “Nobody’s perfect”. Yes, in case you’re wondering, that is an out-and-out anti-Christian statement; if you’re unsure of that at all, just think of the reaction in the media if a movie included a scene where a Muslim joins a Christian prayer group, but lets them know “I’m not Christian”, and they say to him, “Nobody’s perfect”. The mainstream media would absolutely crucify the filmmakers! Maybe it’s all just a coincidence? But, then again, what about the scene with the crazy guy in the ruined city? Captain Hiller’s girlfriend is driving around, helping white people (as blacks normally do), and she offers him a lift, but he turns her down. The crazy Christian is more interested in yelling about the end of the world. Just in case someone might miss the propaganda message that this madman is a Christian, the film makers made sure that there was a cross painted on his placard, which he is holding up for everyone to see. Did you miss that? Not to worry, they also had him wave around a Bible and a big cross in his hand, just so you wouldn’t miss the subtle propaganda connection between Christianity and craziness. Maybe, if you were half-blind, you didn’t notice those hints; so, in their oh-so-subtle style, they painted a big cross in the middle of his forehead. Oh, the complete subtlety of it all, slapping a big cross on his head, Charles Manson style (except that this guy’s cross is much bigger than Manson’s tattoo). Such good work, they deserve to win the annual propaganda prize for that scene alone. When Will Smith captures an alien (whose spaceship crashed, due to some skilful flying by hero Smith), he delivers the live alien to a nearby government base (Area 51). He proudly displays the captured alien and says “Guess who’s coming to dinner?” As any movie aficionado would realise, this is a reference to the 1967 production “Guess Who’s Coming to Dinner”; that film was, of course, a classic piece of propaganda which pushed a multiracialist agenda. So this film is a multiracialist propaganda movie which embeds a homage to another multiracialist propaganda movie; nice one. During the final fight for the Earth, with lots of civilians now allowed inside the Area 51 base, the camera cuts to a scene of the young white daughter of the US President sitting with the young black son of the black civilian heroine, in a carefully-staged small piece of multiracialist propaganda (this is a common propaganda set piece, with the inference being “Why can’t all the races get along together, just like innocent children?”). To have made it a 100% propaganda piece, they would have had the two children join hands, with a camera close-up of a small white hand holding a small black hand; it’s almost a pity that they didn’t do it, just so it could have been pointed to as yet another stereotypical example of propaganda. Who knows, maybe they did film that close-up, but left it on the cutting room floor? The film did include some minor propaganda pieces, such as when it’s time for the President to be briefed in the Oval Office, in marches a black Army officer, followed by a white Army lackey (disproportionate use of blacks in leadership roles is typical in multiracialist propaganda movies). Also, David Levinson’s boss (the head of a major media newsroom), Marty Gilbert (Harvey Fierstein) is heavily camp, and in one scene he is so grateful to Levinson that he gives him a quick kiss him on the mouth (in this film, that character is the only nod to Hollywood’s pro-homosexual agenda). In the close-up crowd scenes, in the USA, when the UFOs are first sighted, non-whites predominate. 1) Three black youths playing basketball. 3) Black hobo and white hobo. 4) Four black youths, under a bridge (then joined by a white). 5) Five people gathered under a bridge (three black and two white). 6) Two white males (one of whom is the first to run). Then there are several wider crowd shots. Each scene by itself means little, but when you add up all of these “coincidences” and details, a pattern of anti-white propaganda appears. Clearly, there is a propaganda message being deliberately pushed in this film. Mind you, a full-on multiracialist propaganda movie would have had the US President played by a black man; a propaganda ploy which was used in various movies prior to the Obama presidency. Or, at least, the top general would have been a black man. But as any clever Hollywood propagandist knows, you shouldn’t go too much over the top, or else your movie will be seen as an obvious propaganda piece, even by the general public; if every main role, or every heroic or leadership role, was played by blacks, then even the unsuspecting public might begin to smell a rat, and realise that they were being psychologically manipulated. Nonetheless, if you can ignore the blatant propaganda, Independence Day is generally a well-constructed movie, with good use of special effects and some creditable film production. But it’s even better to watch it as a study of media propaganda and sly manipulation of the masses. As an example of modern propaganda, this film is a classic, and should not be missed. “It’s a fine line between standing behind a principle and hiding behind one. You can tolerate a little compromise if you’re actually managing to get something accomplished.” ~ US President Thomas Witmore (played by Bull Pullman). “No animal or alien was harmed in the making of this film” ~ movie credits. The makeup artist listed in the credits was “Zoltan”. Sounds like maybe one of the aliens was helping out with the production of the movie.